Intercondylar eminence fractures were first described by Poncet in 1875. 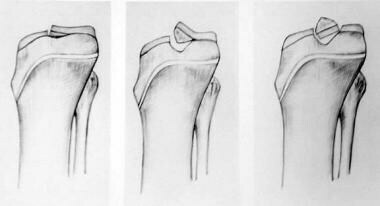 In 1959, Meyers and McKeever surgically addressed only type III fractures (see Classification below). Since then, techniques have improved and awareness of the importance of anterior cruciate ligament (ACL) integrity has increased. Currently, many authorities recommend anatomic reduction and fixation for fractures displaced to any noticeable degree, including type II fractures. The future of surgical management of displaced intercondylar eminence fractures is the arthroscopic approach. As arthroscopic skills advance, the need for an arthrotomy to fix these types of fractures will decrease. Another future direction is the use of bioabsorbable implants for fixation of such injuries, which would provide rigid fixation but eliminate the need for hardware removal. Meyers and McKeever classification of type I, II, and III intercondylar eminence fracture injuries. Intercondylar eminence fractures can extend into either of the articular tibial plateaus. Associated meniscal or ligamentous injuries, such as a medial collateral ligament tear, also are possible. These types of complicating injuries are more often observed in adults, who frequently sustain higher-energy trauma (ie, injuries involving a large amount of kinetic energy, such as those sustained in motor vehicle accidents). Intercondylar eminence fractures in skeletally immature patients usually result from injuries that would cause ACL tears in skeletally mature patients. Meyers and McKeever reported that a large number of bicycle falls produce this type of injury in children. However, intercondylar eminence fractures can be caused by a spectrum of sporting activities and by motor vehicle accidents. Determining the exact frequency of intercondylar eminence fractures is difficult. These injuries were initially believed to be rare; however, their incidence appears to be rising, possibly in part because of a greater awareness of the condition among physicians. The rising incidence may also be related to an increase in sporting activities in early adolescence. Most studies report good results from the use of open or arthroscopic reduction and fixation of displaced intercondylar eminence fractures, or, in the case of minimal displacement, from the employment of closed treatment. Although some studies have demonstrated an increased treatment-related ACL laxity by objective measures, these results do not correlate with patients' symptoms. Meyers MH, McKeever FM. Fracture of the intercondylar eminence of the tibia. J Bone Joint Surg Am. 1959 Mar. 41-A(2):209-20; discussion 220-2. [Medline]. Zaricznyj B. Avulsion fracture of the tibial eminence: treatment by open reduction and pinning. J Bone Joint Surg Am. 1977 Dec. 59(8):1111-4. [Medline]. Burstein DB, Viola A, Fulkerson JP. Entrapment of the medial meniscus in a fracture of the tibial eminence. Arthroscopy. 1988. 4(1):47-50. [Medline]. Lowe J, Chaimsky G, Freedman A. The anatomy of tibial eminence fractures: arthroscopic observations following failed closed reduction. J Bone Joint Surg Am. 2002. 84-A:1933-8. [Medline]. Wiley JJ, Baxter MP. Tibial spine fractures in children. Clin Orthop Relat Res. 1990 Jun. 54-60. [Medline]. Binnet MS, Gürkan I, Yilmaz C. Arthroscopic fixation of intercondylar eminence fractures using a 4-portal technique. Arthroscopy. 2001 May. 17(5):450-60. [Medline]. Najdi H, Thévenin-Lemoine C, Sales de Gauzy J, Accadbled F. Arthroscopic treatment of intercondylar eminence fractures with intraepiphyseal screws in children and adolescents. Orthop Traumatol Surg Res. 2016 Jun. 102 (4):447-51. [Medline]. Memisoglu K, Muezzinoglu US, Atmaca H, Sarman H, Kesemenli CC. Arthroscopic fixation with intra-articular button for tibial intercondylar eminence fractures in skeletally immature patients. J Pediatr Orthop B. 2016 Jan. 25 (1):31-6. [Medline]. Sawyer GA, Hulstyn MJ, Anderson BC, Schiller J. Arthroscopic suture bridge fixation of tibial intercondylar eminence fractures. Arthrosc Tech. 2013. 2 (4):e315-8. [Medline]. Matthews DE, Geissler WB. Arthroscopic suture fixation of displaced tibial eminence fractures. Arthroscopy. 1994 Aug. 10(4):418-23. [Medline]. Delcogliano A, Chiossi S, Caporaso A. Tibial intercondylar eminence fractures in adults: arthroscopic treatment. Knee Surg Sports Traumatol Arthrosc. 2003 Jul. 11(4):255-9. [Medline]. Owens BD, Crane GK, Plante T. Treatment of type III tibial intercondylar eminence fractures in skeletally immature athletes. Am J Orthop. 2003 Feb. 32(2):103-5. [Medline]. Yang SW, Lu YC, Teng HP. Arthroscopic reduction and suture fixation of displaced tibial intercondylar eminence fractures in adults. Arch Orthop Trauma Surg. 2005 May. 125(4):272-6. [Medline]. Bonin N, Jeunet L, Obert L, Dejour D. Adult tibial eminence fracture fixation: arthroscopic procedure using K-wire folded fixation. Knee Surg Sports Traumatol Arthrosc. 2007 Jul. 15(7):857-62. [Medline]. Horibe S, Shi K, Mitsuoka T. Nonunited avulsion fractures of the intercondylar eminence of the tibia. Arthroscopy. 2000 Oct. 16(7):757-62. [Medline]. Louis ML, Guillaume JM, Toth C, Launay F, Jouve JL, Bollini G. [Fracture of the intercondylar eminence of the tibia type II in children: 20 surgically-treated cases]. Rev Chir Orthop Reparatrice Appar Mot. 2007 Feb. 93(1):56-62. [Medline]. Park HJ, Urabe K, Naruse K, Aikawa J, Fujita M, Itoman M. Arthroscopic evaluation after surgical repair of intercondylar eminence fractures. Arch Orthop Trauma Surg. 2007 Nov. 127(9):753-7. [Medline]. Keshet D, Zaidman M, Eidelman M. Treatment of avulsion fractures of the intercondylar eminence by medial parapatellar approach, open reduction and cross wire fixation. J Pediatr Orthop B. 2015 Jul. 24 (4):321-5. [Medline]. Loriaut P, Moreau PE, Loriaut P, Boyer P. Arthroscopic treatment of displaced tibial eminence fractures using a suspensory fixation. Indian J Orthop. 2017 Mar-Apr. 51 (2):187-191. [Medline]. Zhang Q, Yang J, Zhao G, Zheng D, Zhou X, Xu N, et al. A new technique for arthroscopic reduction and fixation of displaced tibial intercondylar eminence fractures, using suture anchor and EndoButton system. J Orthop Surg (Hong Kong). 2017 Jan. 25 (1):2309499016685011. [Medline]. Arthroscopic photo of intercondylar eminence fracture after hematoma evacuation. Arthroscopic photo of intercondylar eminence fracture. Tunnel view of intercondylar eminence fracture. Anteroposterior radiograph of intercondylar eminence fracture. Lateral radiograph of a type II intercondylar eminence fracture in a 16-year-old patient. Sagittal computed tomography scan of an intercondylar eminence fracture. Coronal computed tomography scan of an intercondylar eminence fracture.